Tall standing cup and cover; silver-gilt; embossed; bowl and foot of similar design: constricted around middle and embossed with bold gadroons; lip engraved with floral scrolls; baluster stem with bosses and scroll brackets; cover with seven bosses of same style as bowl; central pillar supported by four scroll brackets and surmounted by figure of Pope wearing tiara and holding crozier and open book, Gregory the Great? ; inscribed. Origin: Nuremberg; c.1620; mark of Michael Müller (master 1612, died 1650). Marks: The two marks (the town-mark and the maker's punch-mark) occur twice: below the lip, where they partly destroy the engraved running foliate scroll, and on the foot -rim. Only the maker's mark is stamped on the cover. (i) Assay mark for Nuremberg, 1600-1700 (R3 3761). (ii) The monogram MM, with a heart-shaped punch: the mark of Michael Müller (R3 415 I). Provenance: Baron Anselm von Rothschild, Vienna, before 1866 (cat no. 217), by inheritance to his son Baron Ferdinand Rothschild (d. 1898). Commentary: Michael Müller came to Nuremberg from Alfeld, and in 1612 was admitted as a master to the guild; after a busy career he died in 1650 in Nuremberg. Rosenberg 1925 gives a long list of pieces by this maker, most of which were in German or Russian collections. The fashionable style in Nuremberg in 1612, particularly for tall presentation cups, was the ‘Neugotik’, favoured by Hans Petzolt, and this Waddesdon Bequest cup by Michael Müller exemplifies this taste in its full-blooded and highly accomplished, three-dimensional form. The twisting, spiralling, lobe-encrusted German cups of the late Gothic period had been the subject of sketches by Albrecht Dürer, as can be seen, for example, on a page preserved in the Sächsische Landesbibliothek in Dresden, executed c. 1507 (see ‘Wenzel Jamnitzer und die Nürnberger Goldschmiedekunst 1500-1700’, exh. cat., Germanisches Nationalmuseum, Nuremberg, 1985, p. 126, fig. 97; also H. Kohlhaussen, ‘Nürnberger Goldschmiedekunst des Mittelalters und der Dürerzeit 1240-1540’, Berlin, 1968, p. 276, fig. 405). A number of late Gothic examples incorporating this twisting element into the lobed design have survived and are illustrated by Kohlhaussen and others, but evidently the taste for them did not die out in Nuremberg because in 1564 the great master of Nuremberg goldsmiths, Wenzel Jamnitzer, made a double-cup in this manner for the famous Nuremberg patrician family of Tucher. The double-cup has survived and is exhibited in the Tucherschlösschen in Nuremberg (see ‘Wenzel Jamnitzer’ 1985, p. 229, no. 23, with illus.). However, the particular and quite distinctive form of Michael Müller's cup was probably not developed as part of this Dürer revival or ‘Neugotik’ movement until c. 1600. Indeed, one of the most comparable extant examples (H. 42.5 cm) is the work of Christoph Jamnitzer, son of Hans Jamnitzer the goldsmith, and is inscribed and dated 1608; the armorial bearings on this 1608 cup commemorate an alliance between the two Nuremberg patrician families of Gammersfelder and Harsdorfer (on loan to the Germanisches Nationalmuseum, Nuremberg; see ‘Wenzel Jamnitzer’ 1985, p. 265, no. 90, with illus.). The cover of this cup by Christoph Jamnitzer is taller than Michael Müller's example and repeats the twisting, spiralling element that is such a prominent feature of the bowl and the foot. Although the cover is, therefore, more skilfully integrated into a unified design, the stem is curiously ill designed, lacking all sense of form and movement; it consists of no more than a straight, thin, cylindrical rod, with four large projecting scrolling-brackets of a fussily inadequate character that in no way serve to unite the foot with the bowl and thereby give a visual unity to the cup. Michael Müller, on the other hand, has used a two-tier stem that successfully continues the tapering outline of the bowl as it descends towards the foot. However, it is doubtful if the stem was his own design because it exists in every detail in a coloured drawing (of a tall standing-cup and cover of the lobed but not twisted spiral type) attributed to the Nuremberg goldsmith Hans Beutmüller (master 1588, died 1622); the drawing, which is dated “um 1610-20”, is in the Bayerisches Staatsarchiv, Reichsstadt, Nuremberg (see ‘Wenzel Jamnitzer’ 1985, p. 361, no. 334, fig. 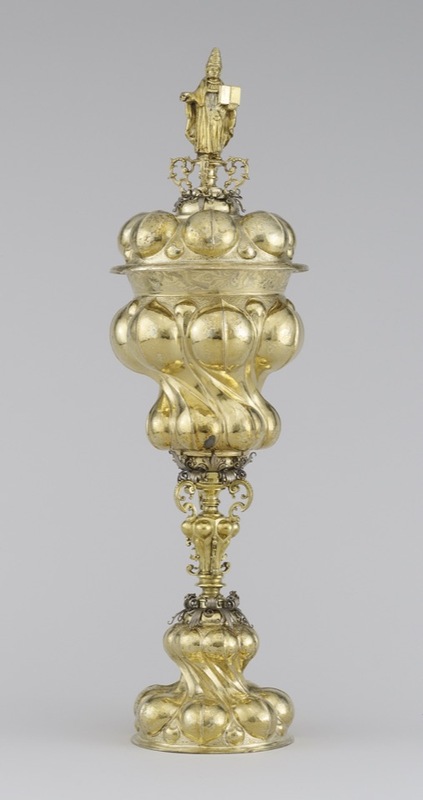 90) and, by extraordinary good fortune, a closely corresponding cup and cover by this goldsmith is preserved in the Schweizerisches Landesmuseum, Zurich (see ‘Wenzel Jamnitzer’ 1985, p. A120, fig. 91). Again, the stems on the Zurich and the London cups seem indistinguishable, except in the most minor decorative details. Because Michael Müller's working life as a master goldsmith overlaps the career of Hans Beutmüller for ten years (between 1612 and 1622), it is possible, though unlikely, that it was not Beutmüller but the younger man who created this new lobed knop and two-tier stem, which he then harmoniously introduced into the Waddesdon gadrooned cup. The Hans Beutmüller drawing and its corresponding silver-gilt covered cup in Zurich are both decorated with similar - if not identical - finials in the form of a tall, two-handled vase filled with flowers. The figure on the cover of Michael Müller's cup is unexpected and quite unlike the normal emblematic finial figures with their elegant poses and graceful movements. At this date, around 1620, the vase or bunch of flowers was beginning to replace the ubiquitous emblematic female figure or goddess, but the heraldic device, perhaps the family crest, continued to be a popular finial to the cover if the cup had been specifically commissioned. When such cups subsequently changed hands, these heraldic finials might be deemed inappropriate and, once removed, the need for a substitute would quickly become apparent. The bearded figure wearing a tall conical head-dress with the triple papal (?) crowns has not been identified, though in Read 1902 it was suggested that it was “perhaps intended for St Gregory the Great”. The figure is cast but is not of high quality, and seems curiously out of harmony with the exuberant curvilinear form of the standing-cup as a whole. Most unexpectedly, an identical finial figure, but holding a large and oddly designed sceptre in the right hand, was found on the cover of a standing-cup in the London Rothschild Collection sold by order of Victor Rothschild in 1937 (Sotheby's, 26 April, lot 223, pl. XXXIX). The sale catalogue entry records that the cup was not by the same maker as the cover; the latter was stated to have been made in “Nuremberg by Jeremias Ritter, married 1605-6, died 1646”. However, even in the sale catalogue photograph the cover seems to show signs of having been altered, with the baluster finial and the 'papal' figure perched unconvincingly on the tall gadrooned cover. Furthermore, the cup that had been 'married' to this cover was stated to be “most probably by Heinrich Straub” and had “a later inscription under the foot: M. DEÜLL. GVSTOS. 1711”. The present location of this object is unknown to the author but it would seem that the inscription (like the 'papal' finial figure) corresponds exactly with that on the Waddesdon covered cup. If these two identical inscriptions are genuine, it indicates that the two objects were in the same place in 1711. It is, therefore, possible that both suffered either damage or a deliberate change to the finials on the two covers, and that at some date in the eighteenth or early nineteenth century they were both supplied with identical 'papal' figures. For a more exaggerated version of this spiral-lobed form of covered standing-cup, reference may be made to the Berlin Schloss example by Martin Dumling of Nuremberg (master 1599, died 1632), which has a tall floral finial that brings its total height to 65 cm and its weight to 1,425 g (see Klaus Pechstein, ‘Goldschmiedewerke der Renaissance: Kataloge des Kunstgewerbemuseums Berlin, Band V’, Berlin, 1971, no. 107, where it is approximately dated “um 1610-20”). Franz Schestag, ‘katalog der Kuntsammlung des Freiherrn Anselm von Rothschild in Wein’ Vienna, 1866, no. 217, with illus. Hugh Tait, 'Catalogue of the Waddesdon Bequest in the British Museum, II : The Silver Plate', British Museum, London, 1988, pl.VII, no. 45, figs. 244-246.